Eighty percent of benign esophageal strictures occur after gastroesophageal reflux. The remaining 20% ​​have causes such as postoperative stenosis, Schatzki’s ring, burns due to caustics and radiation. When an anastomosis is surgically created using either manual or mechanical sutures, there is an inherent risk fibrosis and stenosis at the site of the anastomosis which must be managed with pneumatic balloon dilation. This technique achieves satisfactory results in a good percentage of patients but has recurrence rates that sometimes require multiple dilation sessions. For patients with postsurgical stenoses that are refractory to dilation and whose stenotic segment is short (<1 cm), management with a radial endoscopic incision and resection has good results. The patient was a 49-year-old man who had had a total gastrectomy with Roux-en-Y reconstruction three years earlier. Two months following surgery, he presented dysphagia. A postoperative stenosis was found and initially treated with outpatient esophageal dilation which partially relieved his symptoms. Nevertheless, some dysphagia continued for solids (grade 2). Relief lasted less than 3 months. Esophageal balloon dilation was again performed in December 2013 and in November 2014. This was followed by a very short interval of relief until February 2015. At that point, the patient’s symptoms led to hospitalization. He was evaluated in the Gastroenterology service of the Union of Surgeons located in La Clínica la Presentación in Manizales, Colombia. He was found to be in adequate general condition with grade three dysphagia but without significant alteration of nutritional status despite nutritional risk of dysphagia. An initial endoscopy (Figure 1) found an important area of stenosis. Figure 1 Initial image of postoperative stenosis. The staples and area of circumferential fibrosis can be seen. Laboratory tests were normal, and recurrence of a tumor was ruled out by tomography. Failure of initial management with dilations and alternatives were discussed, and treatment with a radial incision and endoscopic resection of the area of the stenosis was decided upon. The procedure was performed under sedation with propofol, with prior informed consent and under the supervision of an anesthesiologist. A distal esophageal stenosis that prevented passage of a standard Fujinon 10.3 mm endoscope was endoscopically observed in the area of the esophagojejunal anastomosis (Figure 1). Radial incisions were made towards 9 o’clock and 3 o’clock. The procedure was performed with an electrocautery endoscopic tip through the working channel of the endoscope (Figure 2). Figure 2 Endoscopic procedure. Radial incisions were made on the fibrotic segment with an electrocautery tip. Next, the fibrotic segment was cut between the incised sites of the ring leaving the resected segment free. There was no evidence of significant bleeding or evidence of perforation, so the procedure was concluded. No steroid injection was used because an adequate diameter of approximately 12 mm had been reached. Its gross area was less than 75% of the esophageal lumen which decreased the risk of fibrosis and restenosis. In addition, one gram of sucralfate in suspension was administered orally every 8 hours as a mucosal protector. The patient remained in the hospital for two days of additional monitoring until complete oral tolerance of a solid diet had been achieved. Fifteen days after the procedure, a follow-up examination by the treating doctor found persistent relief of symptoms. During a subsequent follow-up 30 days after the procedure, the patient reported no additional changes. He continued to tolerate a solid diet without problems. At his 60 day follow-up examination, endoscopy found continued permeability with easy and adequate passage of the endoscopy equipment and without evidence of restenosis (Figure 3). Figure 3 Endoscopic follow-up 60 days after radial incisions. A: Adequate passage of endoscope. B: No evidence of restenosis. The first-line therapeutic option for management of esophagojejunal stenoses continues to be balloon dilation. However, stenoses that do not respond to repeated dilation and are considered to be refractory to initial management severely affect patient’s quality of life and expose them to risks from multiple sessions of pneumatic dilation. For these reasons, it is necessary to study safe and successful alternatives. This case report shows the potential of radial incision and endoscopic cutting of stenoses. This procedure allowed our patient to recover rapidly and reincorporate into his normal life without dietary limitations that affect his quality of life. 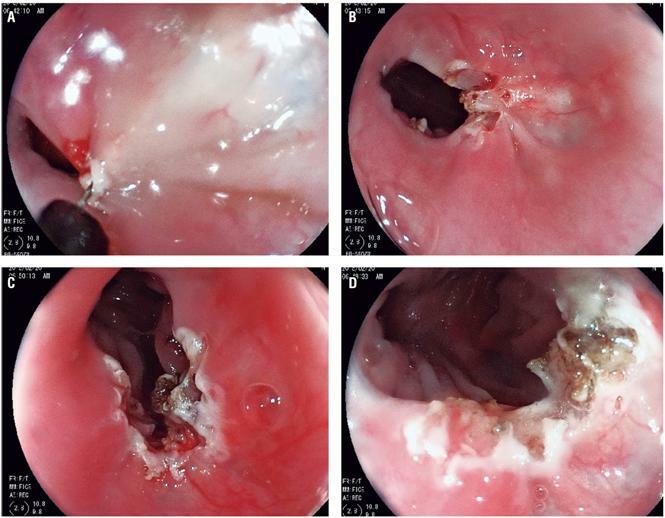 On the other hand, the injection of steroids into the stenotic area has been described as additional therapy for reducing the incidence of restenosis in patients undergoing esophageal dilation and in those subjected to dissection of endoscopic submucosa. 2,3 Nevertheless, there are still no studies that demonstrate efficacy, dosage, frequency and technique.